The 50 year old Essex County Brookdale Park Rose Garden partners the Essex County Parks Department with the Rutgers Master Gardeners of Essex County. The Garden is funded and maintained by the Master Gardeners and community volunteers. The Rose Garden is 15,000 square feet and has 25 beds of hybrid tea, floribunda, shrub, hybrid musk, polyantha, rugosa, and antique roses.The beds are arranged by color: red, pink, yellow, white, bi-color, orange and mauve. The circle bed is white with orange surrounds. We are a no-spray garden and there is no fee to the public for admission to the rose garden. We request that visitors not pick the roses. To volunteer or make a donation to the Rose Garden’s care contact the Master Gardeners. ▪ Prune in early spring with SHARP tools. The North Jersey Public Rose Garden, as it was originally called, was established in June of 1959 by the North Jersey Rose Society and the Essex County Parks Commission. The mission of the Garden was to instruct the public about plant adaptability. Brightly colored rose bushes ringed the flagpole, with several beds of test varieties included. The Garden grew from the 750 rose bushes donated by the New Jersey Rose Society to include 1,500 rose bushes in 29 separate beds. The Rutgers Master Gardeners of Essex County in partnership with the Essex County Department of Parks, Recreation and Cultural Affairs has made great strides in restoring the garden back to its original elegance. Essex County shows its appreciation for the work done at the Rose Garden. 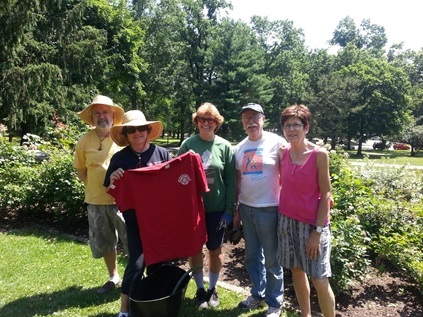 Red T-shirts with the county’s logo were given in appreciation to the Rose Garden volunteers. From left to right are Gary Tonucci, Susan Jankolovits (Chairperson), Suzi Butler, Don Moore, and Jan Tonucci.